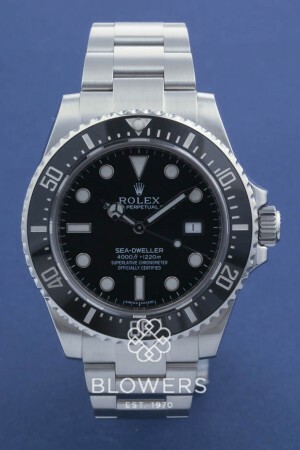 Rolex Oyster Perpetual Sea-Dweller 4000 116600. Automatic Rolex caliber 3135 chronometer movement. 31 jewels, 28,800 vph and an approximate power reserve of 48 hours. which is water resistant to 1,220 meters 4,000 feet. Black dial with index hour markers, date window located at the 3 o’clock position. Black ceramic bezel. Steel Oyster bracelet with safety catch, fliplock and Glidelock extensions. Box and papers dated April 2015. Our reference S22506. SKU: 3108768. Categories: Gents, Rolex, Sea-Dweller.